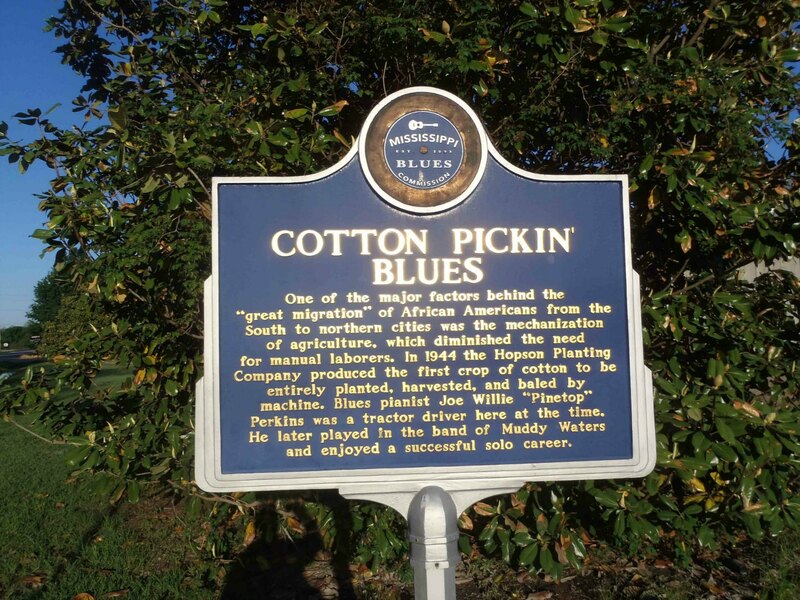 This Mississippi Blues Trail marker for “Cotton Pickin’ Blues” stands at the entrance to Hopson Farm on Highway 49, southeast of Clarksdale in Coahoma County, Mississippi. Mississippi Blues Trail marker for Cotton Pickin’ Blues, Hopson Farm, Highway 49, Coahoma County, Mississippi. The mechanization of cotton production had a major effect on U.S. demographics. Mississippi’s population declined significantly as former farm workers, predominantly African-American, moved to northern U.S. cities like Chicago in search of employment. For decades, Mississippi’s population remained below its mid-1940 peak, before large scale agricultural mechanization caused the migration of workers to other states. As we have commented elsewhere on this site, many small towns in Mississippi show signs of economic hardship; many buildings are boarded up and derelict. Many people we spoke to in Mississippi told us this economic decline started in the late 1940s and early 1950s, following the large scale mechanization of agriculture, as a significant portion of Mississippi’s population left the state in search of work. Many small towns in Mississippi have never fully recovered from this decline in population. 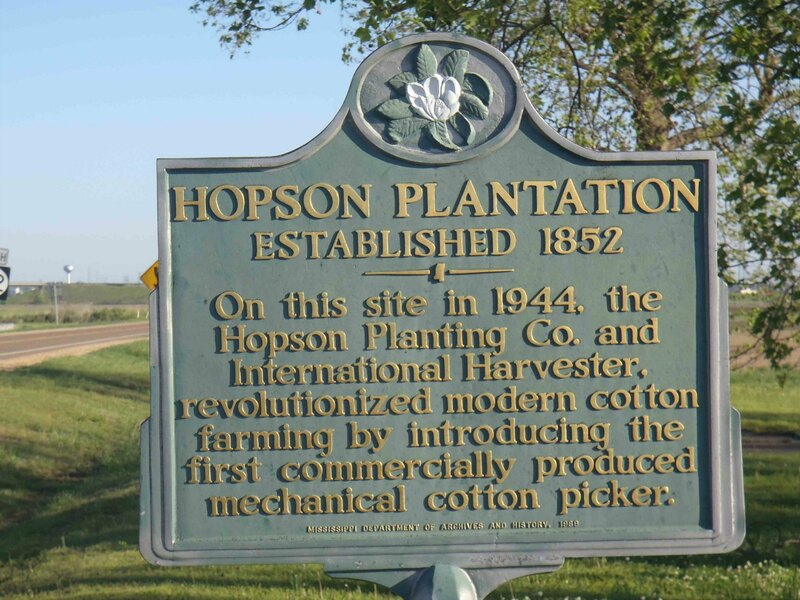 Just across Highway 49 from the Hopson Farm entrance and its Mississippi Blues Trail marker, the Mississippi Department of Archives and History has placed another marker commemorating the introduction of large scale mechanization in cotton production. Mississippi Department of Archives & History marker for Hopson Plantation, Highway 49 at Hopson Farm, Coahoma County, Mississippi. Unlike the Mississippi Blues Trail marker directly across Highway 49, this marker makes no mention of the economic and demographic consequences of the large scale mechanization of Mississippi agriculture. Here is a link to a video showing the latest mechanized cotton harvesting methods. Hopson Farm is still an active agricultural operation. The photo below shows the former Commissary building, near the Mississippi Blues Trail marker at Hopson Farm. Commissary Building, Hopson Farm, Highway 49, Coahoma County, Mississippi. Some of Hopson’s agricultural buildings and former sharecroppers’ shacks have been converted into a hotel called the Shack Up Inn. It’s on our list of recommended accommodation. 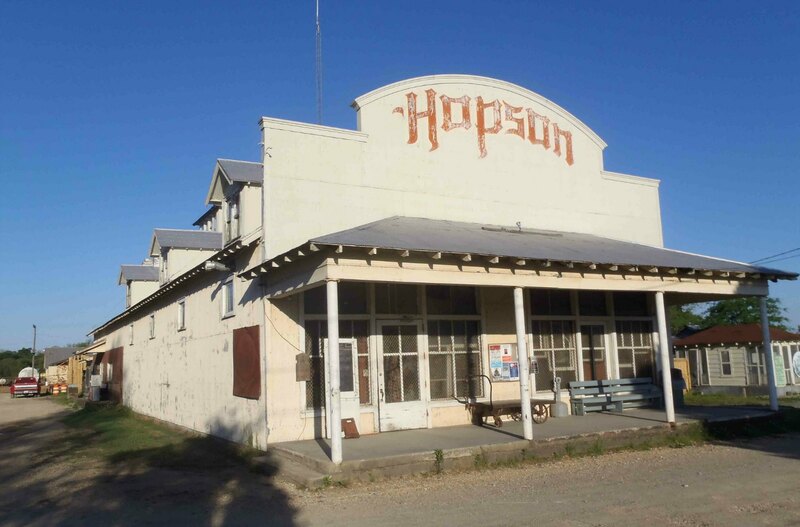 The Hopson Commissary is now a blues venue. Here are some videos of performances at the Hopson Commissary.